Editor’s note: This post is written by Paul Blowers, a chemical and environmental engineering professor at the University of Arizona, who is featured in the module, Using Active Learning Techniques in Large Classes. The first time I turned to active learning in my chemical engineering class was nearly 19 years ago. After two years of trying to teach the psychrometric chart, I realized that explaining a multidimensional plot of what seemed like random things on random axes to students wasn’t working. So in my third year, I flipped the activity and started at the end. Instead of explaining the axes of the chart, I simply asked students how many axes there were. I got numbers that ranged from 1 to 20. Students stayed engaged as I revealed one axis after another, and they began to learn how to approach deciphering a new figure. This first attempt at integrating active learning in my class was a success. I was extremely pleased with myself. I thought I was nailing what “active learning” was and helping students learn. Yet while that particular lesson worked in that particular context, my application of that lesson led me astray and caused frustration for my students during subsequent lessons. Based on my confidence with my one experience with active learning, I thought I could apply that same method over and over again. Thus, my experience with active learning has been iterative and ongoing. Like many STEM instructors, I was forced to work through a number of misconceptions about active learning in real time, noting my successes and adjusting when necessary. Here I share some of the top misconceptions and how I addressed them in my STEM classes. Misconception #1 – Large class sizes stand in the way of student engagement. 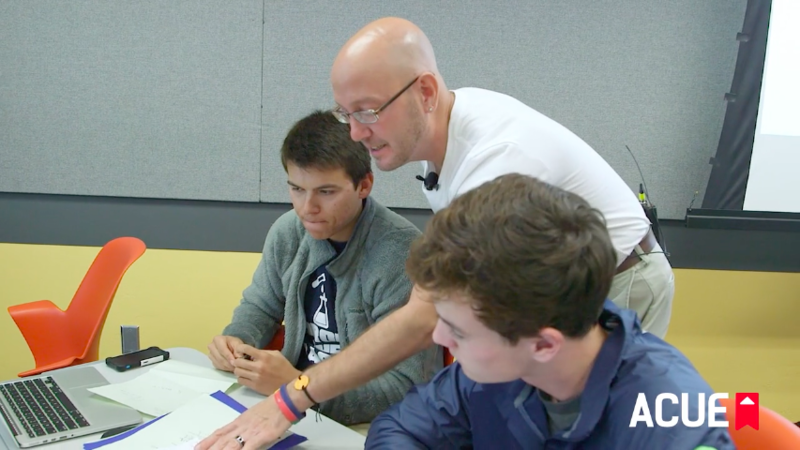 The thought of implementing active learning techniques in large classes can be daunting. But in reality, active learning is quite freeing when you’re facing dozens, if not hundreds, of students. Stepping away from a lecture-style format allows the flexibility to incorporate more group work, and group work is a great way to engage students. When students are working through intense problems with their peers, we can circulate, listen to conversations, and adjust the content we present in real time based on students’ thinking and questions. Additionally, students are given an opportunity to work through problems within a supportive community of peers, which leads to greater success outside of class as well. With the help of learning assistants, students’ challenges and questions can be addressed immediately and we can be nimble enough to revise the active learning process during class. Misconception #2 – Technology is a distraction in STEM classes. The instruction “put your phones and laptops away” is a mainstay in many STEM classrooms. However, I have found that technology can be a great ally in achieving and maintaining engagement in class. During my classes, students use cell phones to snap pictures of their work, laptops to view videos of previously recorded lessons or dig into supplemental resources online, and Dropbox to submit their work at the end of the session for me and the teaching assistants to review. Students are already comfortable integrating technology into their daily lives, so why not work with it in class? Misconception #3 – Students bring to my class sufficient foundational knowledge from prerequisite classes. The reality that students may not absorb as much foundational knowledge as we expect is why formative assessment is particularly important in STEM disciplines. The thing I got right in my first active learning activity with the psychometric chart was an organic form of formative assessment. Instead of explaining concept after concept, this formative assessment allowed me to meet the students where they already were—in terms of knowledge base—and work backward to guide them to a more advanced understanding of the concept. This made it quite apparent that their foundational knowledge of the material was far from what I expected, as they didn’t even know the key terms I was using, like relative humidity and dry bulb temperature, or how to find an axis. Active learning allowed me to organically reach a level of formative assessment that resulted in a more realistic understanding of what the students already knew. I also quickly realized that initial assessment isn’t enough and foundational information needs to be accounted for on a rolling basis. Just because students get something right once, it doesn’t mean we stop reinforcing foundational concepts. That’s why I use a technique called backfilling. Backfilling, which is my own term, is the process of asking a big, complex question that perhaps only 10% of students will answer successfully. These are the questions that are really only obvious to us content masters who have worked with our material for years. Across STEM, these questions might be “Is this a chemical phenomena or a physical one?” (chemistry), “Does gravity matter more or geometry?” (physics), or “Is this something you do with numbers or with variables?” (mathematics). After asking the bigger question, I pose lower level questions, slowly building a more comprehensive view of how students can approach the larger question. I don’t only ask these foundational questions during one class period, but I repeat them over multiple class sessions to ensure student understanding. I argue that no question is too low level. Many of us make the mistake of dismissing certain questions as being “too easy” for our students, but that’s an assumption that we make at our students’ peril. Backfilling, or posing the foundational questions that lead to bigger ideas and reinforcing these introductory concepts throughout the term, allows all students to build confidence with the material and allows instructors to model a process for how experts tackle challenging questions. The quick success with my first active learning activity followed by the quick failure when trying to apply that same concept again made me realize why STEM instructors are particularly poised for long-term success with active learning: because we are awesome at iteration. Our key to success is that we’re comfortable with mistakes. If we mess up once, maybe we mess up a little less the next time, and then we might just have some successes in the end. Working through these misconceptions helped form the bedrock for the active learning techniques I use in my STEM classes today. Utilizing organic formative assessment in my classroom all those years ago allowed me to see that students were missing the foundational knowledge that I had been skipping over. Once I learned that, I was able to help students build a solid foundation in chemical engineering, refocusing the more advanced students on details they assumed or missed and keeping the struggling students on pace to learn the content fully. Success was not immediate, for me or the students, but a growth mindset on all accounts allowed us to progress. And now, in that same class, I experience a 90% to 95% retention rate, which is leagues above the national average of 50% to 60%. All thanks to active learning. Great Blog! I agree with your assertions about the 3 misconceptions and your approach to active learning. Can I ask how you deal with the 90% of students who can’t answer the ‘big complex question’? I find that some millennial learners are quite fragile without support. How do you support them after your first question? To maintain retention at 90% you must ‘catch’ those that might otherwise be knocked back by that experience. How do they dust themselves down to become successful learners? I know that one way that’s worked for me is to do “turn-and-talks” where students fill each other in on concepts they didn’t quite get when I lectured. I found they feel much more comfortable asking “stupid” questions to their peers. I actually encourage it.